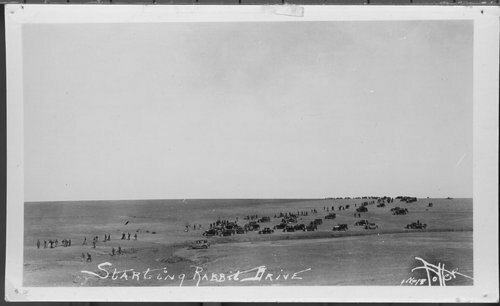 A photograph showing people gathering for a rabbit drive. During the Depression and dust bowl period, areas of the state suffered from an over abundance of rabbits which were destroying pastures. Pens were built and residents gathered to drive the rabbits through the fields into the pens where the animals were killed. While it was a cruel sport, it did save pasture land and the rabbit meat was a source of food.